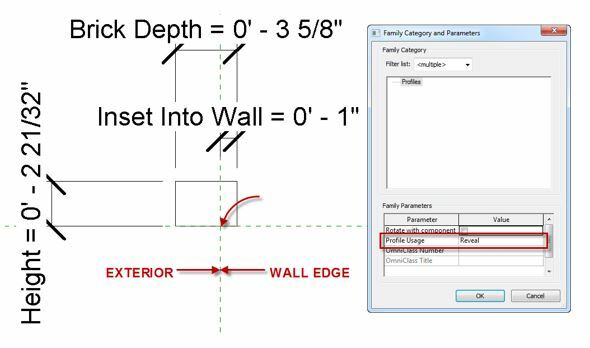 Revit Walls are one of those system families that can seem to be static to work with. 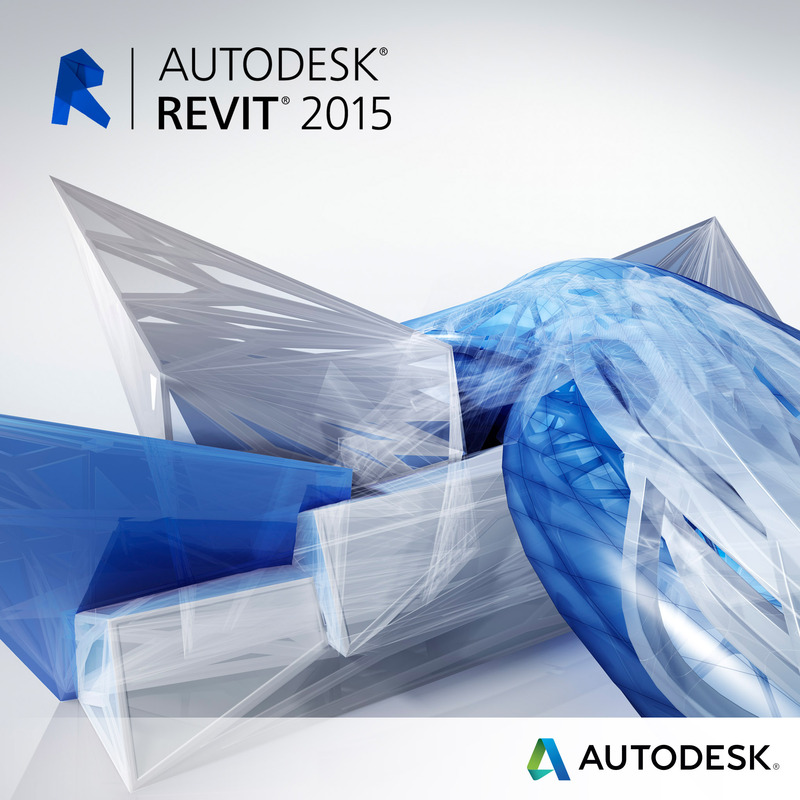 However, one can get very dynamic and push their Revit wall types to new heights. In this post, we’ll discuss how to make your walls vertically complex and express your intent more clearly. 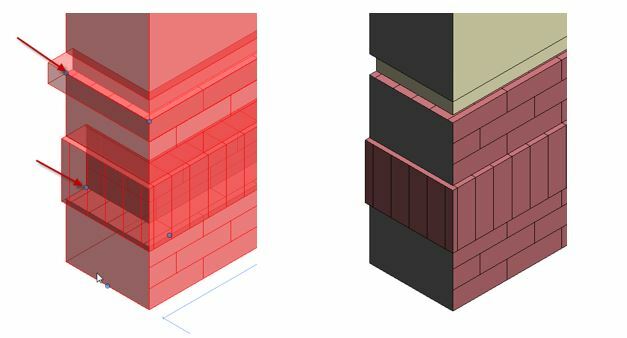 Mastering a wall’s structure in section can increase productivity and understanding when expressing the overall aesthetic and material makeup. 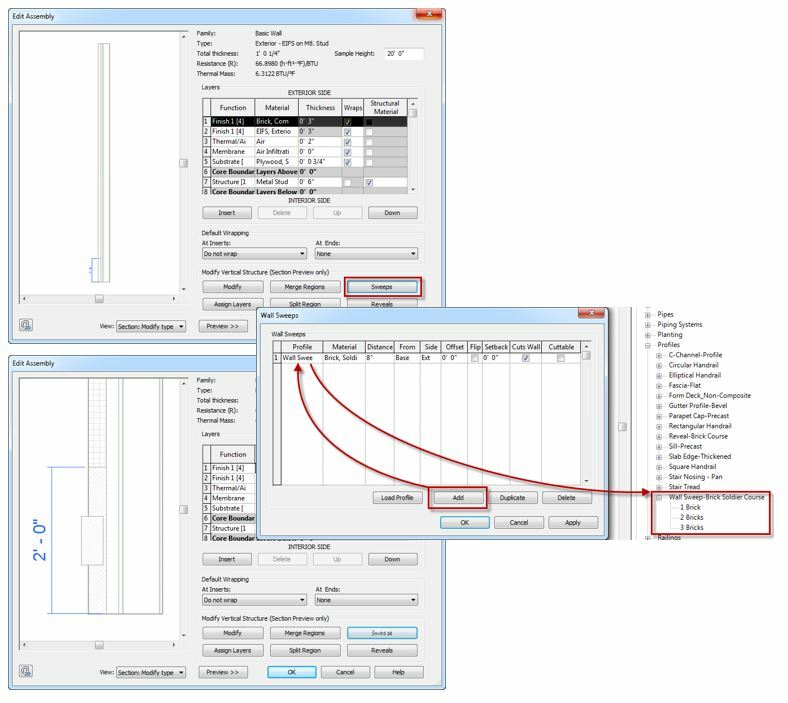 The Type Properties dialog is the starting point for the manipulation of a wall’s structure in section. The first action is to open the preview pane to view the compound wall. A Preview button is provided in the lower-left corner to expand the Preview Pane. 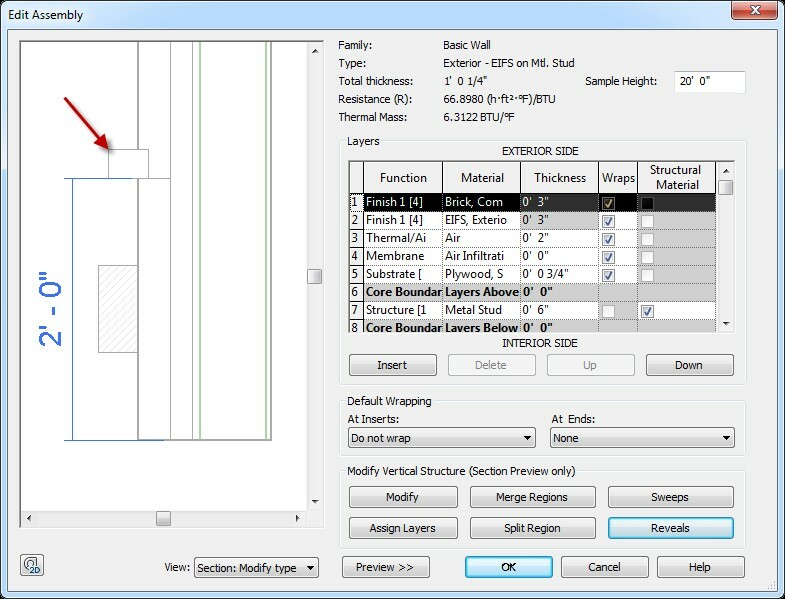 Typically, the wall Type is displayed in a Plan view direction. This is important to remember when moving forward. The second action is to enter the structure of the wall Type. Selecting the Edit button for the structure parameter converts the Type Properties dialog into an Edit Assembly dialog. Now that the Edit Assembly dialog is open, the Preview of the wall Type can be modified to display a Section view direction. Just like Plan view, one can navigate via Pan and Zoom commands. A Steering Wheel button is also available in the lower-left corner of the Preview pane should you need a more dynamic experience when navigating. This will unlock an entire arsenal of specialized tools designed for modifying a compound wall Type vertically. Let’s take a look at each of these buttons in more detail and decipher their roles one at a time. Modify: The Modify button plays the same role as the Modify command on all the Ribbon Tabs. Selecting the Modify button will allow edges to be selected or deselected. 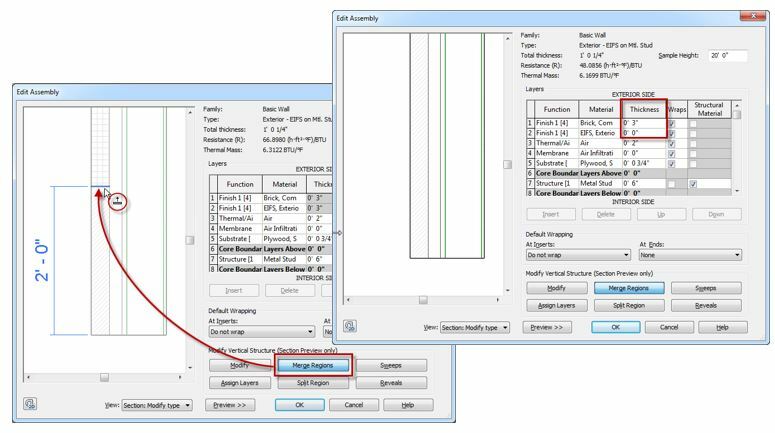 For example, one could select the various edges of a Layer and thicken the Layer or unlock its top and bottom offset constraints. Split Region: The Split Region button works very similar to the Split Element command on the Ribbon. It allows a particular Layer to be Split at various intervals. Using the Modify button afterwards, allows you to manipulate the dimension and whether the dimension is constrained from the top or bottom of the layer. Assign Layers: The Assign Layers button allows an existing or newly created Layer in the Layers list to be assigned to a selected Layer in the Preview Pane of the wall. The assigned layer will inherit the thickness of the target region or split region. Merge Regions: The Merge Regions button allows adjacent split regions within a given Layer or adjacent Layers to be merged into one region. A cursor icon will appear along the common edge to be merged. The direction of the small arrow on the icon will determine which region’s material will be merged thus overwriting the other. 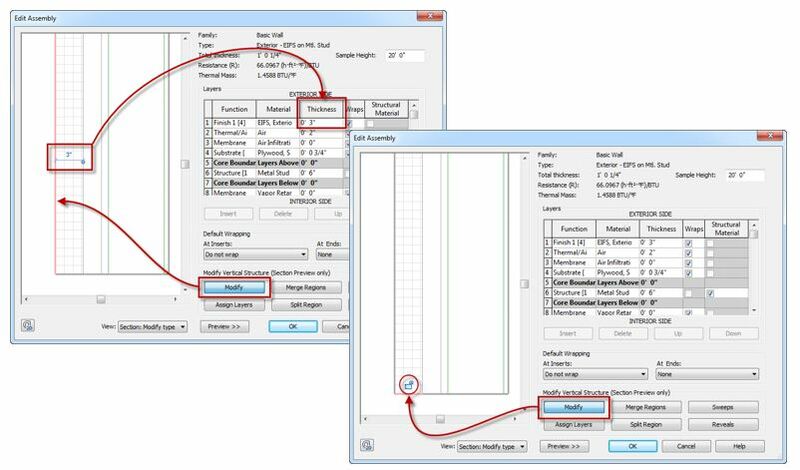 Sweeps Button: The Sweeps button launches the Wall Sweeps dialog and allows the designer to sweep the wall with a profile. From here, wall sweeps can be created and modified to fit the designer’s criteria. The sweep consists of selecting a Type from a loaded Profile family. If a particular Profile is unavailable, the user can use the Load button to insert a Profile family or, create a new one. Then, load the new Profile family into the project. Parameters are made available to set the Sweep’s material, position, orientation, and relationship to the host wall and openings. The location of the sweep Family’s insertion origin is important to consider due to its relationship to the host wall. The Profile Usage is also valuable as to what the Profile will be utilized for. 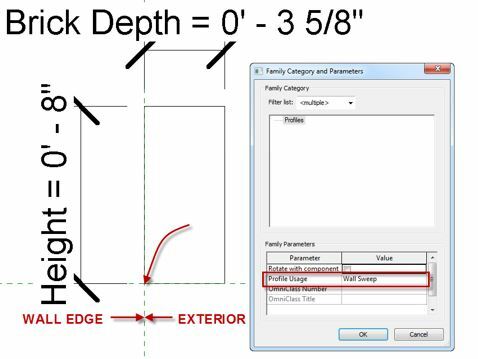 In the case of the example below, the vertical reference plane represents the face of the wall and back of the profile. The horizontal reference plane represents the bottom. This means that the profile will protrude away from the wall surface and insert at its base. The profile will flip along the vertical reference plane. Reveals Button: The Reveals button launches the Reveals dialog and allows the designer to sweep the wall with a profile. Reveals follow the same preferences as Wall Sweeps. However, they remove material from the Layer of the wall it sweeps. The location of the reveal Family’s insertion origin is important to consider due to its relationship to the host wall. Once your vertically complex wall is established, it is possible to manipulate the sweeps and reveals you’ve added to the wall Type. In the example below, the grips are visible when the wall is selected. Once selected, the grips of each sweep and reveal can be dragged to the desired location or, the temporary dimension can be modified to specific distance. If the desirable setback is typical for all openings, you can return to the Wall’s Assembly and modify the Setback value for each sweep and reveal so that it happens automatically at each opening. This will eliminate unnecessary and tedious in-place editing. Sweeps and Reveals can have their returns modified upon selection. Selecting the wall instance will make available the contextual tool Modify Returns. The cursor icon will change to an exacto knife. The selected edge on the sweep will then return on itself toward the wall. This is also possible at the end of a wall. A secondary grip allows the return to be stretched along the wall’s edge. The Align command can be used on the Sweep but, will not work on the Reveal. 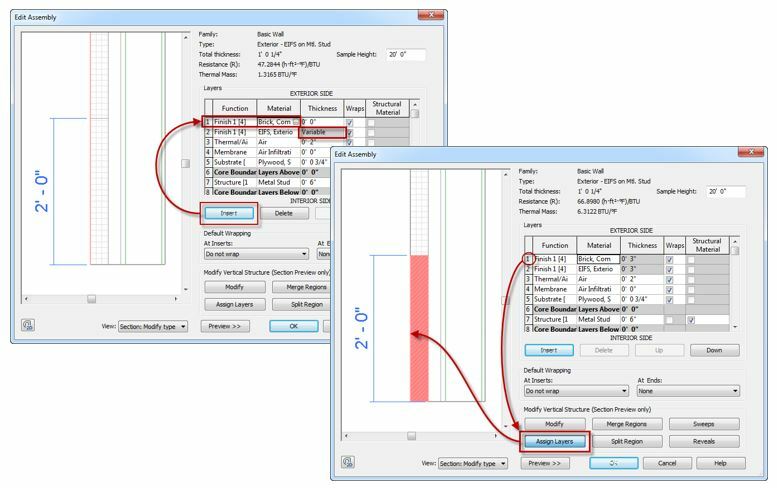 Hopefully, these tips will expand your knowledge of Revit Walls and rejuvenate your design approach and elevate your model’s reliability. 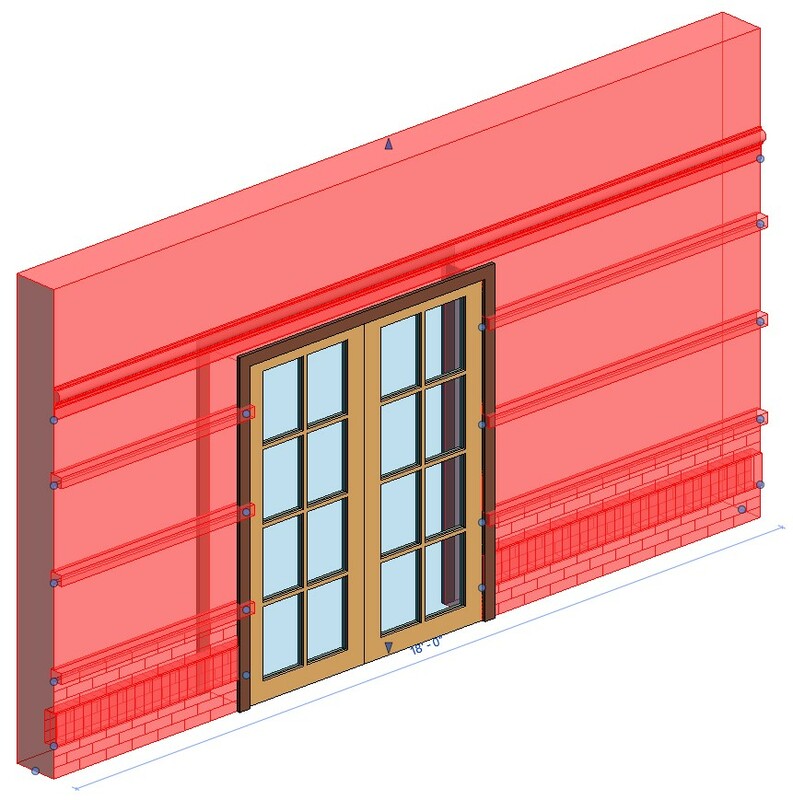 In the next post, we’ll dive into more Revit Wall Basics using simple tools to create complex features. Subscribe or check back.